“Done with indoor complaints, libraries, querulous criticisms/Strong and content I travel the open road,” yawps Walt Whitman in his “Song of the Open Road.” After reading Ted Conover’s exhaustively-researched and earnestly-written The Routes of Man: How Roads Are Changing the World and the Way We Live Today, I fantasize him musing, “Yep, verily, Uncle Walt,” and dashing out the door to be on the road again for several years, on several continents. We are wandering critters: Ulysses, Chaucer’s pilgrims to Canterbury, Don Quixote, Bunyan’s Pilgrim’s Progress, our pioneer’s wagon trains, Dorothy’s yellow brick road, Jack Kerouac and the Beats crisscrossing the U.S. (Kerouackia?) in On The Road. And as Conover mentions in his introduction, we sing about it: the Grateful Dead’s Truckin, the Allman Brothers’ Ramblin Man. Rolling Stone magazine just named Bob Dylan’s Like A Rolling Stone the best of 500 pop songs. Conover travels six roads around the world noting progress and improved lives along with deathtinations and miseries brought by routes:” hauling Peruvian mahogany from the jungle; walking with kids in isolated Ladakh along their “road”, a frozen river at 11,500 feet, to perhaps a better life; trucking with Kenyans along sections of the Kinshasha Highway that links Congo with East Africa, a path that already has cost an estimated ten million lives as a transmission of the AIDS virus; through checkpoints and daily dangers of roads in Israel’s West Bank, war commuting; a weekend holiday trip with some of China’s millions who now own autos; and surviving the daily carmageddan in Lagos, Africa’s largest city, as he rides with the Lagos State Ambulance Service. His harrowing account brought to mind Nigerian novelist Ben Okri’s idea of the road as evil creature with its own power in his novel, The Famished Road. 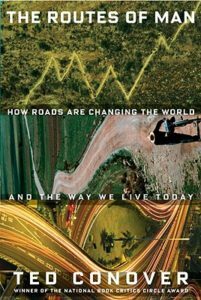 Conover’s Epilogue handily provides us a collection of the many road metaphors we can’t escape: fork in the road, road to ruin, long and winding road, up my alley, speed bumps, a rocky road that’s a straight shot. The road less traveled. “The Routes of Man: How Roads Are Changing The World And The Way We Live Today,” by Ted Conover, Knopf, $26.95.